So this is the book everyone was buzzing about at BEA this year. It's name just seemed to be in the air everywhere I went. And I made it a point to sit in on the Dystopian Lit panel and the YA Buzz panel, both of which featured the delightful Ally Condie with her new novel Matched . And she really was delightful. One of my most memorable moments from the entire conference was listening to her describe the origins of a scene in the book, which included her chaperoning a high school prom in which a boy proposed to his girlfriend on the steps of the building. Needless to say, it was a sticky situation for the chaperons as they weren't sure whether to be happy for them or to jump in the middle and yell, "You're making a big mistake!" We in the audience had a good laugh at that one. So it was with great anticipation (and not a little fear) that I cracked open Matched a few nights ago. Whenever the hype surrounding a book is built up so high, I find myself afraid to start it for fear it won't measure up and then the sadness will set in and who needs that, right? But look at that cover. I mean, wow. Dutton can package a book, can't they? The truth is I was simply not up to resisting a dystopian novel with that cover. Cassia Reyes is about to attend her Match Banquet. All her life she's waited for this evening--the night the Society would reveal her Match. This person will be her partner in every sense of the word. Over time they will be allowed to court, along approved guidelines and with proper supervision (of course), they will receive jobs in their assigned professions, they will marry and produce healthy, strong children. In the words of the Society, they will achieve optimal results in life. Cassia is giddy with anticipation. What will he look like, this face that will appear before her on the computer screen? Will she like him? Will he like her? Was the beautiful green dress she chose the right choice for the occasion? And then, suddenly, all her questions are answered (and fears allayed), when her best friend Xander's face shows up on the screen. It almost never happens--being matched with someone you know. Everyone is surprised and pleased for Cassia and her family. Such luck to already know and care about the person you will spend the rest of your nice, neat life with. Cassia is happy and so is Xander. Then she logs into her computer at home to read more information on her Match and a different face appears. A different boy in place of Xander. And she knows this boy as well. This Ky Markham, with his serious eyes and closed face. Cassia's mind is immediately sent into a spiral of panic. What has happened? Which boy is her real Match? The Society never makes mistakes. Does it? It really is a great idea. The whole setup is absolutely full of potential and I love the world Ally Condie has created. The atmosphere is appropriately stifling, made even more chilling because none of the characters are aware they are being so clearly and methodically oppressed. I liked how I felt immediately angry on their behalf. And how I felt sick to my stomach at a few of the so-called Society's methods of creating and ensuring such idyllic lives for its citizens. But the thing is, I would have felt that way on behalf of anyone. It wasn't these characters specifically that moved me. I kept wanting more from Cassia. I know she was just barely waking up to the realities of her life and her place as a cog in the wheel, but she never felt very distinct to me. Like the fluff of the cottonwood tree, she is borne here and there on the wind. And I wanted her stronger, more vibrant. Ky was clearly supposed to be different and Cassia (and the reader) picks up on that. But, honestly, their connection never felt like it reached its potential. It felt like another case of me being told these characters were a certain way, but the reality of those "ways" never punched me in the gut the way they really have to if I'm going to care about them in any meaningful, lasting manner. In the end, it felt like I was reading a prequel to the main event. And, while there is nothing wrong with a strong setup, it does help if there is some form of crisis and action in a book--even the first book in a trilogy. See The Hunger Games . Speaking of which, that book crouched over my shoulder while I was reading this book, their similarities hard to discount. Xander the golden boy, Ky the outsider, Cassia caught in the middle. The writing itself was very clear and precise and I appreciated that to an extent. But the preponderance of short sentences actually began to wear. And I know that, too, was representative of the oppression and Society, but it felt forced to me, rather than natural. As though it was trying so hard to create an effect, but I couldn't see past the effort to the effect behind the words. I wanted to love Matched . But I ended up merely lukewarm in the end. Perhaps things will pick up with a vengeance in book two. But not caring about the characters themselves will prove a difficult hurdle for me to overcome. Others will not feel the same way though. And I feel certain Matched will find itself a loyal and appreciative readership. Just not me. Matched is due out November 30th. I had a hard time with this one too. It reads easily, but I never formed more than a superficial connection to the characters. This book did not work for me. The worldbuilding fell flat. If the whole point of their society was to promote "longevity" and their diets and exercise and life choices were all mapped out for them for that specific purpose, then why were so many members thrust into jobs which would make them die young? Why were they all forced to die at what we'd today consider old, but not "a lifetime of longevity-promoting behavior" old? Most of my family has lived past eighty! It read as if the author though to herself "oh, that'll be cool to have in there" and put in all the stuff she thought was cool about other dystopian novels but with no rhyme or reason. It was like she put Farenheit 451, The Hunger Games, Uglies, The Giver, and 1984 through a shredder and picked out the pieces she liked best. And no matter how many times Cassia told me she was in love with Ky, I didn't feel it. And the pictures? I couldn't make heads or tails of them. Could he really draw like that on a paper bag? I think this is probably a book meant for people who have NEVER read another dystopian novel and won't spend the whole time going "eh, I liked this better in the GIVER." Also, a head's up to publishers: love triangles for love triangles' sake are LAME. That's too bad. I thought this one sounded good, but I don't like novels where I can't connect with the characters. Thanks for the honest review! I'm glad you reviewed this one. 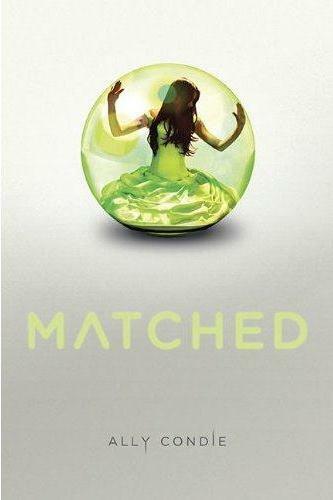 MATCHED was the one book at BEA I regretted not being able to find. I don't think your review has turned me off but it makes me feel a bit better about missing out on getting an advanced copy. Hey Angie I've been thrilled about this book too! Sad to see you felt lukewarm about it. I was hoping it would get a better reception. This is too bad. I have been coming to realize that hype can be a very bad thing for me, and I'd begun to fear more than anticipate for this one, too. You hit upon all the things that bothered me about this book as well. Sigh. Well, then! I've been wondering whether this one would live up to the hype, and now that I've skimmed your review (I'm paranoid like that) and looked at the responses in the comments, I think I know how I'll feel about it. Thanks for the honesty! I'm very intrigued! Thanks for the heads-up! I just found your blog a few days ago, and I am loving it! Did you draw the banner for your blog yourself? Amy, my pleasure. And, yes, I was ready to scream at her for not doing a bloody thing! Grrr. Lenore, exactly. I could give or take them. And I never missed or wondered about them while I wasn't reading. Always a bad sign. Anon, oh man. I could not get THE GIVER, FAHRENHEIT 451, and THE HUNGER GAMES out of my head. You're spot on there. And the writing didn't measure up. And I, too, didn't feel Ky at all. Like you, I'm really, really tired of the love triangles. Ugh. La Coccinelle, well, that's cause it's absolutely gorgeous! I mean, really pretty. But everything about it was lackluster. Janice, hey, I'm more than happy to mail you my copy if you want. I'd be interested to hear what you thought. Sami, like I said, I think it's probably it will get a good reception. It's got all the buzz and contains the rather traditional elements in YA lately. We'll see, I guess. Holly, yeah. *sigh* And I absolutely love it when I'm proved wrong in my early fears. Love it. But that did not happen this time. And it is lame. Steph, yeah, I kind of figured from your review that similar things bugged you. They just really kept me from enjoying it as a whole. celi.a, and that's what I hope people will get from the review--a sense of whether or not it's for them. Read the Book, you're welcome! And no, I didn't draw the header myself. My incredibly talented brother-in-law did. As a gift to me. I <3 him big time. :) Don't be a stranger! Chachic, I know. It really is sad when that happens. I wish it had gone differently. Darn, I was hoping this would be a great one. I love the cover so much. Thanks for the review. Sami, I did! It arrived yesterday, in fact. And I adore your sketch on the envelope! Can't wait to start it. I was disappointed in it too. I liked the whole idea, loved the usage of Dylan Thomas' poetry, and yet always felt it was dystopia light. Thought I was the only one who thought this! Angie, I'm glad you liked it. I'm really, really out of practice. Bookgeek, "dystopia light" is the perfect way to describe it. For the faint of heart, I suppose. You are definitely not alone! And I love the Thomas poetry but it felt forced to me. Kris, you definitely should find out for yourself. Sometimes characters just click with some people and not others. I couldn't see my way to liking these three, but you might. I actually really liked this book. I really liked the world created by Condie. I'd love to follow your blog with my blogspot blogger dashboard, but I can't find the link for that on your page. I'll just save it as a favorite for now and try to check back!